Sixty Four Robe MMX spots were used on the largest show of the German NEONSPLASH Paint Party tour, a new concept from Miami that fuses the best dance sounds and DJs with the visual spectacle of dancers stilt walkers, aerialists, all wrapped up in one super adrenalized party vibe. The highlight of the evening comes when the audience – in white dress code – are splattered with UV-active paint via a series of compressed air canons placed around the room to provide the colour as the scene changes from monochrome to glorious Technicolor. Event producers for the German leg of the tour included Whateversclever from Hamburg and technical solutions provider Rec-Tec SFX & Technic Solutions from Sinzig who joined forces to present NEONSPLASH at the 10,000 Essener Grugahalle. 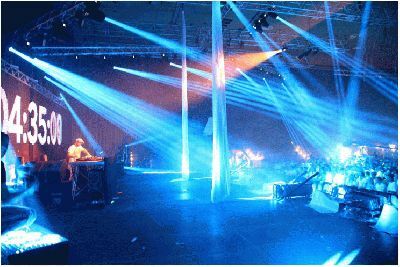 Taking the party out of clubs and into large arenas called for a completely different concept in staging. The lighting design and truss layout was created by Oliver in’t Zand and Markus Hoffman who originally designed 32 Robe MMX Spots into the show. However, when they started encountering difficulties getting hold of some of the other moving lights on the spec, the MMX count was doubled to 64. These were delivered by dry hire specialist Niclen from Dortmund, who have recently boosted their Robe stock, adding a lot of MMXs, and also from SN Music Event Service based in Bonn. “I was extremely satisfied with the MMX Spots,” enthuses Oliver in’t Zand who also operated the event’s lightshow. He comments that the units are “Bright, lightweight and ultimately flexible”. He especially likes the wide zoom, which opens many more possibilities than a ‘conventional’ spot light fixture, and the iris and the automatic hot-spot control which creates “Pin sharp, very narrow, bright beams”. He was also suitably impressed with the MMX’s overall reliability – they all ran for 12 hours solid, being worked extremely hard – performing completely flawlessly.